We have heard Dinagat Island National Highway is expected to start this year. Let me ask everyone … what do we expect from a 100 million-road project? Or we’ll simplify it this way; we have around 100 kilometers road to build and 100 million pesos to spend. That brings us more or less a budget of 1 million pesos per kilometer span. Would this be enough? Would this road be designed for 4-wheel vehicle? Would this be 2 lane asphalt or concrete? I supposed this could be done easier this time since road is already existing compared to starting from scratch cutting trees, clearing hills and forest. But remember this highway is been declared DONE long time ago in the 70’s during Navarro’s term. I’m also thinking after the build would there be budget to maintain the highway? This is PROGRESS. Indeed a good government investment. A road access to each town is a good deal. Now we have an option. We can choose not to survive more than two hours of waves. We can transport goods faster, safer and less expensive. Fast and convenient transportation brings opportunity. This will also bring more tourists and investors in the Island. 1 million pesos per kilometre of road? what kind of road can anyone build with that budget? I've never been back in Libjo for more than 12 years now and in my simple calculation granting you have P100 per cubic metre of sand and gravel and P25.00 per bag of cement it already cost P1.5 million for a 6 inches thick of concrete!!! !but road construction is not limited to concreting but there are other preparations to be carried out prior. 1. Survey..... who's gonna do it and how much it cost? 2. Surface preparation.... we need bulldozer, grader and rollers, dump trucks, fuel etc. How much it cost? 3. Fill Materials..... subgrade materials how much it cost? 5. Drainage system..... how much it cost? Those are the basics in road building and someone from the island of Dinagat will look at it prior to jumping on a conclusion that P100 million is enough for the complete delivery of the project. P100 million is big number and if you can't deliver or complete the project, the reaction of the public is different they will just say " The in charge of the project is corrupt" which is unfortunately true. So, to the people involved or going to be involved in this project please do the MATH it might create disappointments. Correct! 6 million daw dapat ang budget per kilometer. So kung one million lang. Tama ka dyan Habal-habal highway lang gihapon ang mahimo. KUNG from Loreto to Cagdianao ang himo-un. Pero pag ang highway himuon 3 kilomters from downtown San Jose lang dako kaayo ang kickback sa administration. I do totally agree with you Rex, libjo was in a big loss when you left that town...you were a superb engineer. Whereever you are working now, that company got a big assest. Keep up the good work. Okay nalang to kay sa wala jamo mga sano!!!! kahit saan ka magpunta ng pinas same problem, Tulong nalang ta na masaayos ang atong kalsada, anyway 100 million is just okay kay di naman na virgin ang kalsada, widening, compacting and concreting nalang man. Siguro paguwi ko bibili na ako ng AWD to roam around the island and find some cool pplaces to hang around hehehehehe. I know that there is alreay an existing road in Dinagat Island. Widening? Compacting? Concreting? Look, if you widen a road network the best way is to cut further in a mountain rather than backfilling it. How are you going to stabilise the slope? To tell you....slope stabilisation to prevent land slide will cost you a fortune!!!!! the cheapest is soil nailing which is in my last job cost us $ 32 dollars each soil nail excluding drilling and grouting!!! if the engineers are ambitious enough to use cable bolts or stressing tendons how much it cost? Dinagat even Surigao has no equipment to do the job!!! Next is drainage system.... you can't stop the rain and if you don't have a good drainage system it will create problem and erosion/land slide which will of course worst come to worst affect the system and will cost government money to repair it. If you have 100 kilometres of road network so as the drainage system required. Compacting...hmmmnnnn even the simple sand replacement method to check compaction Dinagat has no capabilities to do it!!! Will, If you can afford to procure a 4WD or AWD up to you the issue here is not for an individual... the issue here is for the people of Dinagat. Mr. Engr., your calculation/computation is correct but that is only as far as mathematics is concerned. Your other assumptions are too personal to consider. Topic ! : You can answer your question... the government will always have the agency to do it, either a private or government one. Topic 2: Do you think the Dinagat folks themselves will do the works without any contractor to whom the government will award the project? And, if there is the contractor, are you sure that it is not well equipped with heavy machines? Topic 3: Perhaps a quarry can be opened somewhere in Dinagat where fill materials can be obtained? What do you think? Topic 4: (I will not discuss this anymore... you can answer your question, I guess). Topic 5: If topic 1 is done, then we can calculate the cost. YES THERE ARE PEOPLE WHO CAN DO THE JOB you're correct and I agree with you and again you have to look back the budget IS IT ENOUGH? I think positive that is why I am asking questions... ARE YOU? If you will tell me that the budget is enough to complete a decent 100 Kilometres of road then YOU ARE NOT THINKING POSITIVE.. YOU ARE DREAMING!!!! My assumption is wrong I presume since the prices of the materials on my first post is way way below what is really the cost of materials right now. Please don't forget that the estimate is only for materials and LABOUR COST IS NOT INCLUDED!!!!! Just a question for those who didn't see what I saw... ARE THERE ANY FREE LABOUR IN LIBJO???? If our friend is expecting the contractors to do the job do you think do you think they will do the right thing????? A quarry can be opened somewhere but then again you will need heavy equipment to do that or if you're unfortunate and encountered a rock 5 times stronger than concrete what shall you do? Ha ha ha! Mr. Eng'r. I don't need to argue with you. In higher mathematics, 1+1 is not always 2. Rex, there are mathematics wizard in this country not to make the country good but to find a hole for themselves in order to get a slice from the government funded money. Yes 1 + 1 is not always 2 but we don't need those wizards we need a simple math and simple people to get the job done. Private contractors? forget it. When are you going to come home anyway?????? 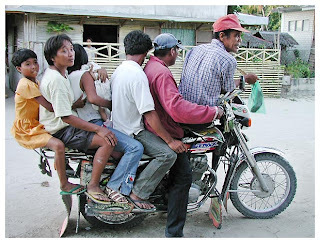 halleerrrrrrr.... tubag pod tawn mo kun pila mga pamasahe sa habal2 karon oy? Basta para nako, kun gusto jod himoon ang project mahimo man ba? Naa pod tawn mga bag-o nga equipments ang mag contractors oy.. Medyo hi-tech na gud ang Pinas..., syempre maapil pod sa kahig ang Dinagat diba? regards ko dinha sa taga bolod specially kan mary ann conales. Para molambo ang ato pamumuhay mudawat ta ug suggestion, commento Para dili ta ma ignoranti. Ky kong ignoranti ta or pretending blinded baka di ta aasinso paano na ang mga anak natin nor mga sumosonod na hinarasyon. Para din to sa mga official sa albor para mag karoon din sila ug idea ug mapa wide pa ang ila deskarte ug mga plano. Maging alerto at sa ka curious tayo para matakot na ang mga corrupt na official sa libjo. 1 million per kilometer is too small..the exact budget per kilometer should be 10M per kilometer..I hate comparing but i think your congressman G.Ecleo is doing nothing in her PEDAF...Congressmen are entitled of 200M to 300M a year..where is that PEDAF?As part of GMA infra projects, the budget has been released but what happened was, concreting from Loreto just stopped. u know, in doing goverment projects, it will undergo invitation to bid...to those potential and capable contractors..DPWH is the agency incharge of awarding potential projects to capable contractors...i've been in bidding because, i was once in the business, usually big contractors paid those smaller and less capability to do the project in order for them to win the bidding. that's business...who ever is the lowest bidder will win..take note that quality should be considered..usually the business is package deal...100M is very small for a project asa huge as that...experience wise, 10M per kilometer is the right price for that...that includes heavy equipment rentals, labor, fuel,cement, technical persons, everything.....Philip & Sons,Co. hmmmm...what do we expect in government projects?ofcourse it will lead to corruption right?no projects no corruption will happen, hope that road will long last. ok lang bisag rough road basta naa kay sa magbaktas subay sa lasang o subay sa baybay. ang mga driver raba way mga lisensya pati motor way rehistro bisag batang grade 1 pwede mag drive way mudakop,karon naay bago na problima ang tubig arang ka mahal sa libjo 50 pisos ist 10 cu.m tapos 10 pisos per cu.m sobra... mahal pa sa manila..MGA PULIS! sigi gihapon ang balsa sa truso sa dapja san antonio libjo DAKPA POD NINJO OY! ajaw mo pag agad sa mga SB kay dili na nila work og angat eleksyon karon.